WEST COLUMBIA, SC -- The honors just keep coming for Airport High School’s Student Council. 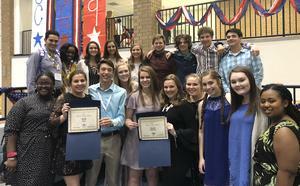 For its exemplary record of leadership, service and activities that aim to improve the school and community, the Lexington Two school’s student council has been recognized as a 2019 National Gold Council of Excellence by the National Student Council. It’s the third year Airport High’s Student Council has received the award. Among requirements of a National Council of Excellence Award, a council must have demonstrated successful sponsorship and participation in activities such as leadership development and service to the school and community. Councils like Airport’s, which are awarded at the gold level, have successfully demonstrated the highest levels of leadership. The latest recognition comes on the heels of several honors Airport High received during the recent state convention of the SC Association of Student Councils. The council received gold recognition for a third year for its leadership work, the highest recognition at the state level. The council also received a first place 4A/5A Fundraising Award for its annual Camp Kemo Charity Drive, which this year raised nearly $55,000; and a first place 4A/5A Community Service Award for the school’s Reading Buddies program. Among individual honors at the state convention, Katie Kyzer was inducted into the Terry McCoy Hall of Fame, while Trace Wingard was recognized for his service to the South Carolina Association of Student Councils for serving as District Chairman this past year.